Woohoo! 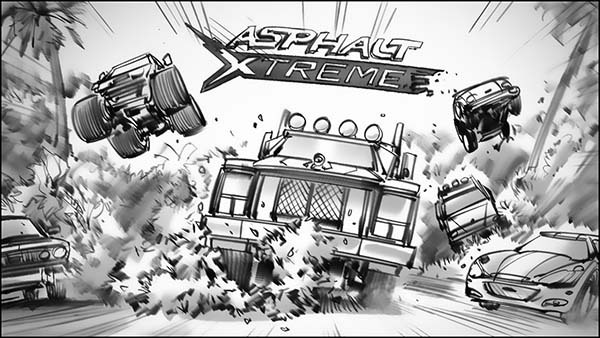 Here’s another fun project from earlier this year that I’m very proud to show- fun video game racing action! 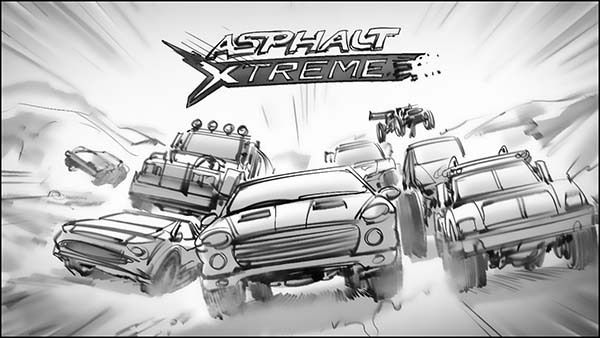 The “Asphalt” Series is well known in gaming circles as a premium racing product and I was very excited to be involved with my clients at PSYOP for their pitch and production of this great spot. 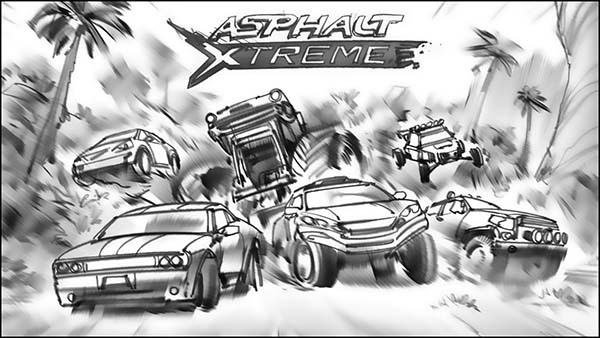 Conceptually, it’s very simple: Showcase the main themes of the game series: Racing, Mayhem, and Variety. 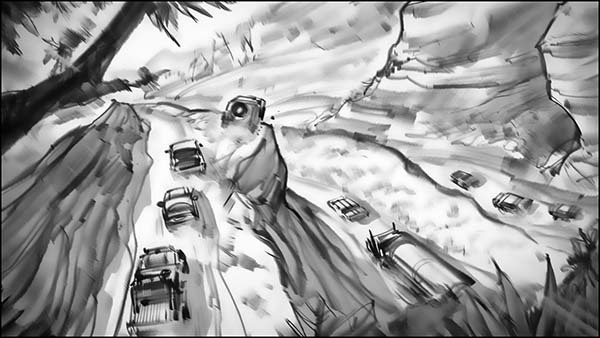 Variety of cars, and variety environments. 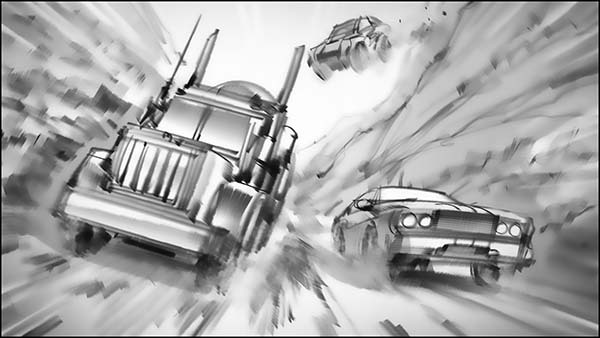 Hate to say it, but this was kind of an easy one for me… A commercial like this has no room for subtlety, so it’s just a matter of attempting to give equal weight to the important elements (variety of cars and environments) and balance that with a ramping of the action to an ultimate climax, all within 30 seconds!! EXTREME!!! This project had two parts- the pitch and the production. For the pitch (in which we try to “win” the job), we kind of had a looser goal- wow the client with, well, creative compositions to showcase the action and variety. Promise them the moon and see if we can deliver. There were all kinds of different ideas being tossed about- mostly the idea was to bring a realistic visualization of the gameplay to the screen. Also on the job were some very talented 3d and concept artists, and we all pitched in to contributed pieces of the final puzzle. The pitch was won on the merits of this collaboration- some of which I’ll share with you below (they didn’t make the final cut, but helped advance the job along, and look cool, besides!). 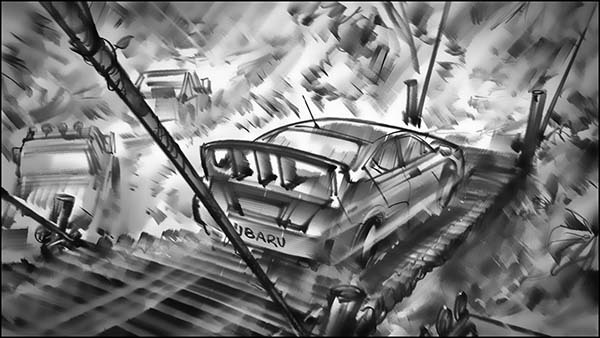 I liked the idea of a rally car using a hidden rope bridge to find a shortcut to get ahead of the main pack! Many video games have hidden passageways, and this was in that spirit. 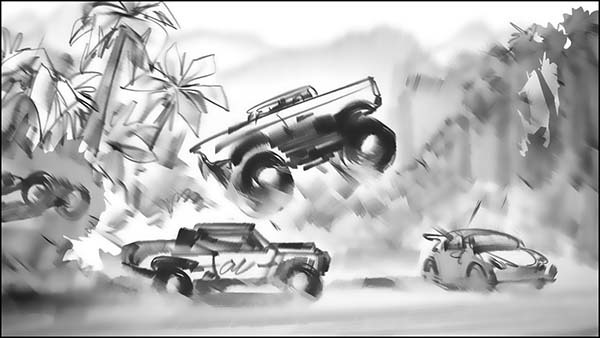 As above, so below; an early concept of the dune buggy jump- it was an earlier understanding that these cars would “find” the best route forward based on their natural abilities. 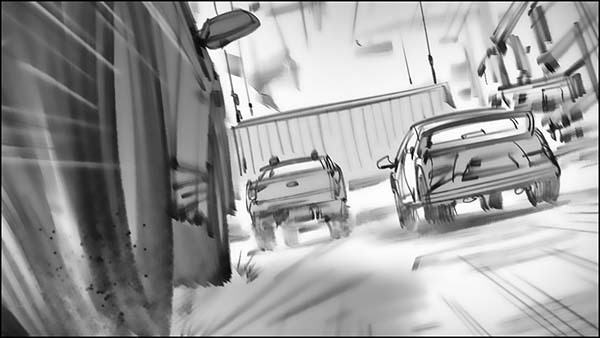 I really liked the sense of speed in this early frame- many of which were drawn based on other artist’s tight compositions. Among the natural environments, we assumed there would be a mandate to have more urban or industrial environments as well, but not so much in the final edit. Nevertheless, we had prepared works in the case of that possibility. Here, the racers surge towards an active loading dock area. 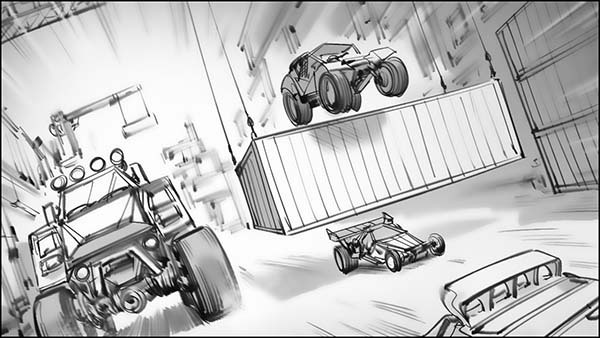 Again, we see the variety of cars and car abilities in their approach to surmounting the dynamic racing obstacles before them. Seeking to really emphasize the sense of racing through rally courses worldwide, we seized upon opportunities to utilize highly recognizable landmarks and locations. Concept for a “desert” title composition. Another alternate concept for a “Jungle” title composition. It was a great team effort, and we won the job. Now comes the hard part- execution. They had me back to refine some concepts and nail transitions into something that hit all the marks. You ready for the boards? Here you go! And here’s the final spot! What a wild ride! Soo….. Sometimes I have a massive amount of input on a job, and I feel like I get to pick all the shots, and control the pacing, and the visual storytelling (remember, for many jobs, and certainly in this case, I’m not even given a script or shotlist). 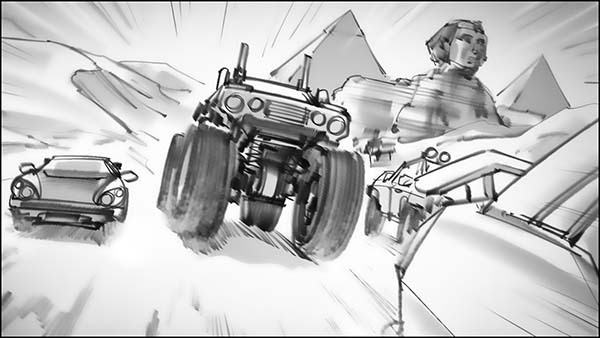 BUT in this case, much of the concepting was done by talented 2d and 3d artists working concurrently- and so about the only idea I want to point out that I specifically contributed was the opening transition where the camera appears to be POV from the view of the bumper, but pulls out to be the POV looking into the reflection of the bumper. As far as I know, I “invented” that, at least in this kind of car/racing/bumper context. The thing about that kind of camera move is, it’s something you can only pull off in CG, so you’d never see that in classic cinema- since you’d have to magically “erase” the reflection of the cameraman. So, there you go, I did something cool. But even so, just as much if not more credit goes to the director and the CG artists for actually pulling it off and making it look amazing- you never know with uncharted territory, but that’s life… TO THE XTREME!!! !